Herod I the Great (born 74/73 BC; 40 – c. 4 BC) was the son of Antipater I the Idumaean (died 43 BC), the founder of the Herodian Dynasty. Herod I became the Roman client king of Judea who is remembered for establishing the Herodian kingdom. During the course of the Roman Civil War between Julius Caesar and Pompey the Great, which erupted in 49 BC, the political power of the Jewish world was also dramatically altered. His father Antipater had gone to the aid of Julius Caesar when he was surrounded by Ptolemy XIII in Egypt who had opposed his sister Cleopatra VII. As a reward, Antipater became a “friend” of Caesar, which provided the foundation for his heirs and their close relationship with the rulers of Rome. Furthermore, Caesar had bestowed upon Antipater a Roman citizenship which bestowed the privilege of freedom from taxation. Additionally, Antipater’s sons Herod and his brother Phasael were named governors of Galilee and Judea, which further cemented Herod’s later position of power following his father’s assassination in 43BC. In 40 BCE, the Hasmonean Antigonus II Mattathias (40 – 37 BC), who had fled to the Parthians, saw his chance and seized power. For the promise of a payment of 1000 silver talents and 500 women slave girls, he succeeded, with Parthian assistance and his Jewish supporters in conquering Jerusalem according to Josephus. Herod I was forced to flee Jerusalem with his family and sought refuge in the desert fortress of Masada. Herod I proceeded to Egypt to seek the help of Cleopatra VII in Alexandria. She received him most graciously, declined to aid him against Mattathias Antigonus. Herod then continued his journey to Rome to seek help. He requested the help of Rome to guarantee him the crown of Judea. Marc Antony and the Roman Senate named Herod King of Judea and Samaria. After a week, Herod returned to Palestine. There the struggle for sole reign began with Mattathias Antigonus resulting in a war that lasted another two and a half years. In 37BC, Herod laid siege to Jerusalem to take power and captured it with the help from the Roman general C. Sossius. Herod captured Antigonus along with his political backers in the city. Herod ordered the execution of 45 members of the Sanhedrin which had supported the previous Hasmonean dynasty. The Sanhedrin, which would later seek the death of Jesus, was reduced at this time to a religious court ending its control over the state. From this moment on, Herod ruled Judaea complete with the support of Rome. Herod then proceeded to Samaria to marry his fiancé, the Hasmonean Mariamne. This was a political dynastic marriage as Herod had married a Hasmonean in order to reinforce his claim to the royal title. Antigonus Mattathias, the last Hasmonean king, was brought to Antioch and there beheaded. Herod I is known for his major building projects in Judea which included his expansion of the Second Temple in Jerusalem, the construction of the port at Caesarea Maritima, the town of Herodium with the cone-shaped fortress, and the fortress at Masada. Details of his life were recorded in the works of the 1st century the Jewish historian Josephus. He also appears in the Christian Gospel of Matthew as the ruler of Judea who orders the Massacre of the Innocents at the time of the birth of Jesus. Upon Herod’s death, the Roman Emperor administered his will and divided his kingdom among three of his sons and his sister—Herod Archelaus became ethnarch of the tetrarchy of Judea, Herod Antipas became tetrarch of Galilee and Peraea, Herod Philip became tetrarch of territories north and east of the Jordan, and Salome I was given a toparchy including the cities of Jabneh, Ashdod, and Phasaelis. The Early Coinage of Herod the Great is like that of the Hasmonean rulers. 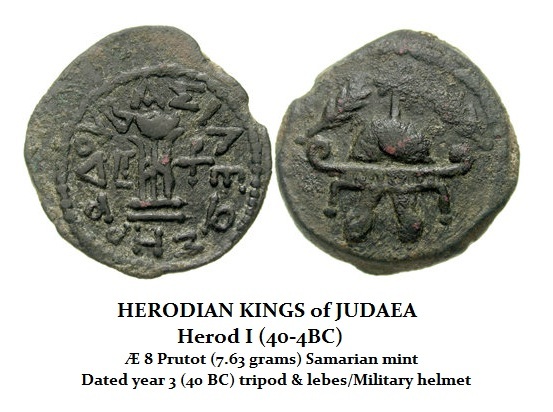 Herod also minted bronze coins in order to secure the local currency of lower denominations in his area of dominion. The high valued coins were Roman. His earliest coins appear to be those with the inscription “year 3” (LΓ). This dating refers to Herod’s third year as king, i.e. 37 BC, the period after his victory over the last Hasmonean king Antigonus II Mattathias.